Who doesn't love this intricate, colorful pattern? It makes a bold statement on your table, or it can be mixed with a solid or neutral for a more subtle combination. 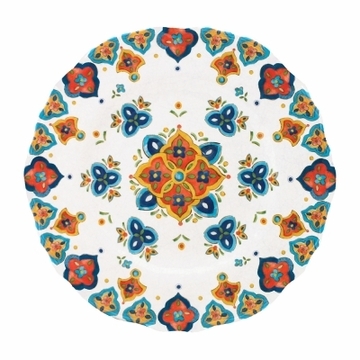 Le Cadeaux Marrakech dinnerware is made of triple-weight melamine that is virtually unbreakable, so it's perfect for indoor and outdoor entertaining, including patio, poolside, on the water, or on a picnic. Warm up to the vibrant, geometric pattern that is as versatile as it is beautiful.